New Zealand is the small island close to Australia that is always in the shadows thanks to Australia. But New Zealand is a beautiful place all by itself, offering you both adventure sports and water sports along with a dose of nature. When you go to New Zealand, here is a list of places that you must definitely visit. The National Park is a world heritage site protecting incredible scenery. The glaciers here are dramatically carved with the fjords of Milford, Doubtful Sounds and Dusky. It is possible to explore everything from cascades and lakes to rainforest, islands and mountain peaks.The park is also a brilliant hiking destination. Situated along so many water bodies, this water sports destination also has sea kayaking. The Bay of Islands is a popular vacation destination consisting of around 144 islands that make it a fabulous water sports destination. You can also expect to see water animals like Penguins, dolphins, marlin, and whales. Kayaking is also famous here as well as the hiking trails you can find everywhere. Queenstown is filled with adventure and is one of the best adventure sports destinations in the world.You can also enjoy water sports like whitewater rafting, jet boating, downhill skiing and paragliding as well as other adventure sports like rock climbing, mountain biking, bungee jumping. This is also the famous place where movies like The Lord of the Rings was filmed. This hiking destination is filled with trails and is famous for the day walks that take place here. 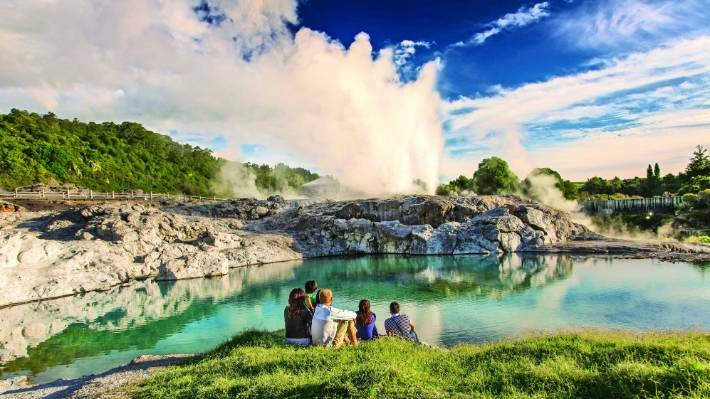 It has volcanic features and it’s important for the Maori culture which makes it a world heritage site with dual importance Popular vacation destination. This geothermal region is on the Pacific Ring of Fire, where the earth speaks. This dramatic topography has everything from hissing geysers and boiling mud pools to volcanic craters and steaming thermal springs. To enjoy the beauty, the tourists generally take a walk along these wonders to get the physical experience of the place. These are the most accessible glaciers in the world and are named after famous expeditions. The coastal climate that you find here makes it easy for the tourists to enjoy the glaciers on foot. There are also pinnacles and ice caves found on the glaciers. Along South Island, which is also the sunniest regions, there is a trail that extends for about 51 kilometers. You can spot fur seals, penguins, the range of birds and you can even snorkel in coves. The view is also panoramic providing a view of the coastal cliffs, making it a photographers paradise. Around 40 percent of the park is covered with snow and glaciers. The tallest mountain in the country, Mount Cook is present along the borders of the park. The place is also a sweet haven if you love flora and fauna as it contains more than 40 species of birds and 300 species of plants. The park is also famous for its adventure sports like ski-touring, hunting, hiking, scenic flights and heli-skiing and stargazing. Found along Hawke’s Bay, the sunny region of Napier provides the best gourmet food. The Art Eco Architecture is also beautiful here. A powerful earthquake had destroyed the town in 1931. The town was later rebuilt by Art Deco Design in the Spanish Mission Style. The seafront has the Pania of the Reef statue, which is a famous statue from the Maori Mythology. The City of Sails has two sparkling harbors as well as sandy beaches that are both blond and block-sanded. There are hiking trails along the rainforests, volcanoes, and islands as well as picturesque coves that make it a popular vacation destination thanks to the scenic beauty provided. By going to the Sky Tower, you can also appreciate a picture perfect view. New Zealand is a beautiful country that is filled with picture perfect scenes everywhere. You can also appreciate the scenic beauty that you have seen in so many movies in person. If you are looking for a vacation to enjoy nature, then a trip to New Zealand is the way to go.